We are shipping Big Foot 10-1/4" Worm Drive Beam Saws with the latest Skil® motor and also have kits available for your new (SPT77w) and old (HD77) SKILSAW®. Big Foot Saws, Kits and Blades are in stock and shipping daily. If your dealer doesn't have it, call us direct and we'll point you to one that does! 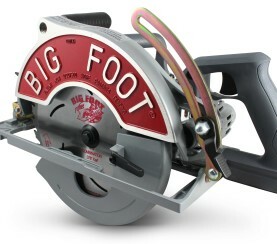 Don't settle for imitations, get your original Big Foot Saw today, the Big 10 Inch! 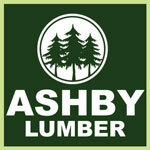 We are the largest saw adapter company in the world! Big Foot Tools is not your average, everyday tool manufacturing company, and neither is the man who envisioned the company and these—quite literally—cutting edge tools. Robert Hutchings worked as a framer and carpenter for nearly three decades, and it was because of these years of on-the-job work experience we have so many of the tools we offer. The Big 10 Inch! Don't Settle for Imitations The BIG FOOT Saw will cut your 4x headers, double 2x sandwich headers, exposed beams for decks, porches, 4x4 fence posts, plates and 7 sheets plus of 1/2" Plywood with one cut. Q Do you sell the 14 inch Big Boy Adapter Kit without the saw? We do not sell the 14″ as an adapter kit. It is sold only as a complete saw. 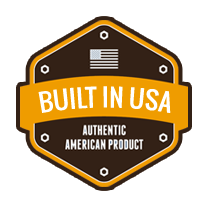 Q Will the Big Foot Adapter Kits fit DeWalt or Rigid 7-1/4″ saws? Our Big Foot Adapter Kits were designed to fit the Skilsaw 7-1/4″ saws. Q Does the Big Foot 10-1/4″ Adapter Kits fir the Skilsaw 8-1/4″ worm drive saw? The Big Foot 10-1/4″ Adapter kits do NOT fit the Skilsaw 8-1/4″ worm drive saws. 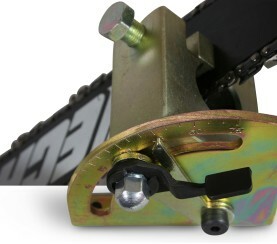 The Adapter Kits were designed to fit the Skilsaw 7-1/4″ saws (SPT77W). Q What size nails can I use with the Big Foot Pea Shooters? The Pea Shooters are compatible with nail sizes 3D to 30D, with a nail head size 13/64” to 7/16”. Q Will the Big Foot 10-1/4″ 75° Swing Table fit other 10-1/4″ saws? 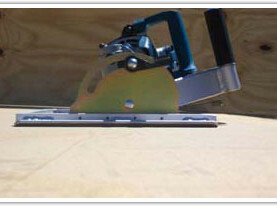 The Big Foot 10-1/4″ 75° Swing table was designed for the Big Foot Saw, and is not compatible with other saws. Unfortunately our Adapter Kit does NOT fit the Skilsaw 7-1/4″ Lightweight Magnesium saw (SPT77WML-22). The body of this saw is shorter that the regular 7-1/4″ skilsaw (SPT77W), however our parts are made of magnesium making the saw lighter than other 10-1/4″ saws. Q How much of the chainsaw bar do I lose when clamping on the Big Foot Head Cutter? You will lose a minimum of 4” when clamping the Head Cutter chainsaw attachment on to your chainsaw. Q Why do I need a bigger gage cord for my Big Foot Saw? 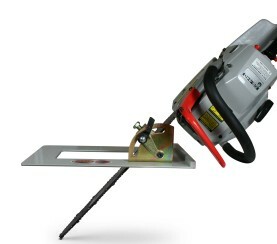 The saw is an after- market attachment for your Skil/Bosch 7-1/4” saw. The 10-1/4” blade draws more amps than your factory saw. By using a 10-gage cord you will draw fewer amps, resulting in a longer life span for your Big Foot Saw. Twenty year-old Big Foot Saws are still in use today. Q Why are the Big Foot Parts made out of magnesium? Magnesium is roughly 34% lighter than aluminum. 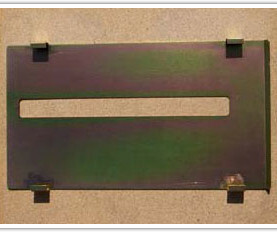 Big Foot Tools was the very first company to offer a complete saw with all guards made out of magnesium. Q Does the Big Foot 10-1/4” Saw have a warranty? 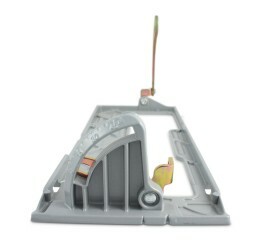 Yes the Big Foot Saw has the same warranty as the Skil®/Bosch® 7-1/4” saws. There is a 1-year warranty on all Big Foot parts. 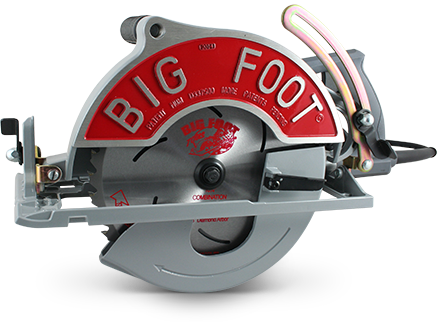 Q Does the Big Foot 10-1/4” Saw meet OSHA Standards & requirements? Yes, the Big Foot Saw meets all OSHA Standards & Requirements, and all the stat requirements, also. 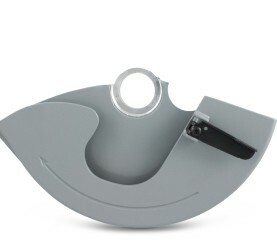 Q Is the Big Foot Blade too thin & does it wobble when ripping? No, it doesn’t wobble at all. The Big Foot 10-1/4” Blade was designed for the Big Foot Saw itself. The only reason for the Big Foot Blade to wobble is missing teeth or being dull. So always keep an extra 10-1/4” blade on hand with you. Q Does the Big Foot Saw’s weight make it difficult to use all day? No, the saw weighs only 14.68 lbs, which is the tool only, not including the blade and cord. That is only 0.55 lbs heavier than you standard 7-1/4″ SKILSAW® you are already using today. 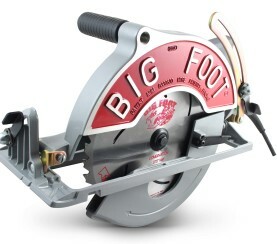 Q Can I turn my Big Foot Saw back into a 7-1/4” saw once I have adapted the Big Foot Kit to my saw? No. Once you convert your 7-1/4” saw into a Big Foot 10-1/4” saw it can’t be turned back to a factory 7-1/4” saw. Q Does the Big Foot Blade have a diamond knockout? Yes, all the Big Foot 10-1/4” Blades have a diamond knockout. Just place your new Big Foot Blade so the writing is facing down and the hole is elevated up. Hit the corner of the round hole. The diamond knockout should pop right out. Below is a list of some of our valued distributors. If you are looking for a distributor iin your area, give us a call at 888-798-4499 and we'll be happy to help!